What a great way for the post to be delivered! This entry was posted in bicycle culture, Newcastle and tagged Cargo bikes, hamilton, quirky bike, street cyclist, unusual bikes. Bookmark the permalink. Do you remember the delivery bicycles used by the Auto part shops such as Smiths Sons and Repco, also by Robersons Bros engine reconditioning, they had two wheels up front and one at the rear with an unbelievable size wooden box over the two small front wheels, the apprentices would deliver parts with these bicycles all over the Newcastle area, including heavy reconditioned cylinder heads, OH&S would be on to it today, Wayne..
Hi Wayne, no I don’t remember them, but an interesting observation and part of our history. They sound as if they would be quite unstable to me. Thanks for commenting! 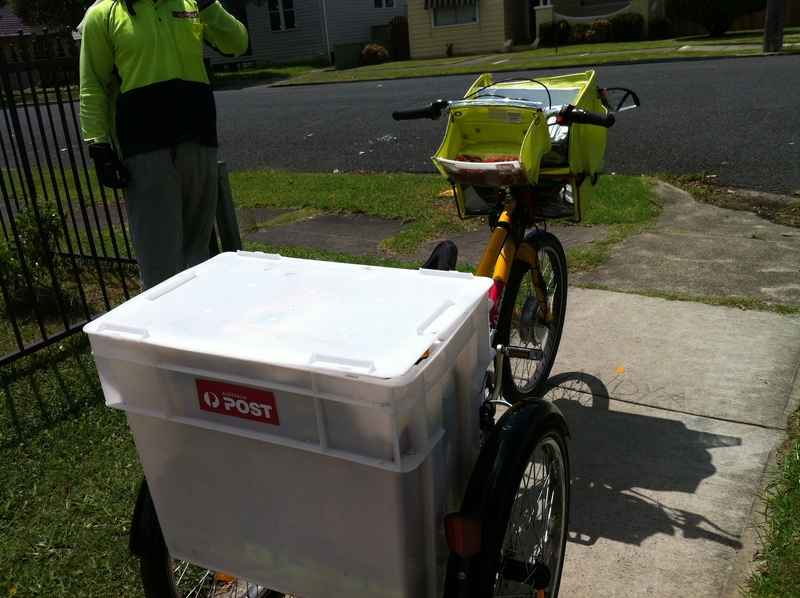 Exactly the opposite, with two wheels at the front the bicycle is far more stable than the postie bike, it has smaller wheels but wider with a greater contact patch than the normal single front wheel, the steering is heavier though with the greater contact patch and the extra weight that is carried in the box. Many famous cars were built using this principle and one of these has since began production of a three wheeler based on the same lines as it built 80 years ago, best wishes, Wayne. Hey, that’s cool! If we used more of those in the U.S. our service might not be in such a crisis. That is the only one i have seen here Annie. 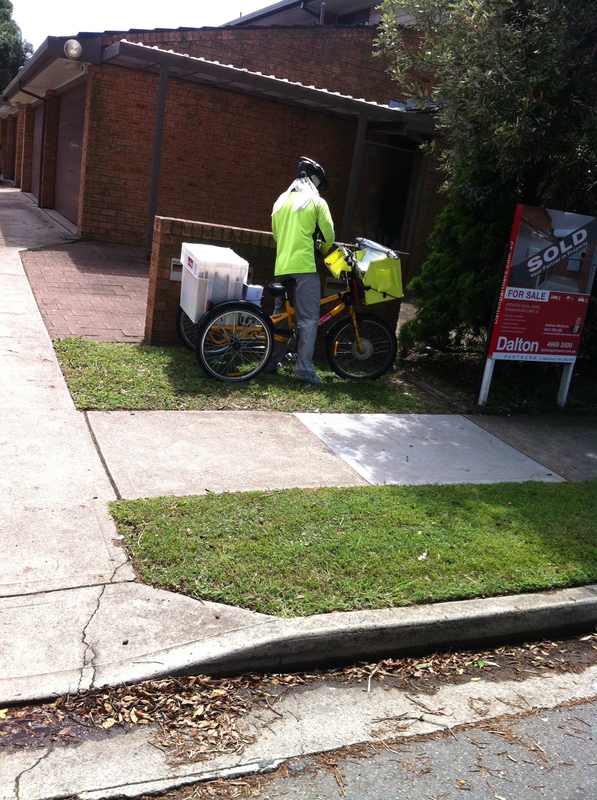 Usually the posties use small motorbikes, though occasionally I have seen them using bikes or ebikes. Wayne, I remember seeing three wheeled cars when I was in Italy a few years ago, I think the single wheel was at the front and they were tiny cars, like small utes, are these the ones you are talking of? I can’t comment under your comment so have replied down here. Hi Vicki, the three wheeler cars with a single wheel at the front were very scary things to drive and steer, I rebuilt one on a Greek island called Telendos, it was the only vehicle on the island and was used to pick up goods from the jetty and deliver them to the tavernas, they all treated me like a magician when it was up and running again, it kept trying to tip over. The one that I am thinking of is the Morgan and is back in production again with an American engine fitted between the two front wheels. Some of the delivery bicycles only had one small front wheel in order to allow the fitting of the large box and were accidents waiting to happen especially when the parts in the box moved from side to side, best wishes, Wayne. Ha, these vehicles seem to cross over between being a bike and a car, it’s difficult to know what to call them in some cases! Yes you are right, but we are getting away from the idea of the blog and that is concerning bicycles in Newcastle. But it is interesting to see that at the beginning of the evolution of the automobile, motorcycle and even the aircraft was ” the bicycle”, they all used it as a base for their designs, best wishes, Wayne. It is still interesting to know that all those machines relate back to the bicycle though!